The St. Helens Lions boys basketball team was good enough to contend for their first win, but probably still too green to collect it when they played Dallas at home on Tuesday night. The Lions — starting a freshman, a junior and three seniors, and with limited depth — made big strides in their second outing of the 2018-19 season. The Dragons managed to hold them off, though, winning 56-49 thanks to their better execution and finishing down the stretch, and with an edge at the free-throw line (13 of 23 to St. Helens' 7 of 12). First-year St. Helens coach Zach Waldher had reasons to be encouraged, despite the loss. "Our kids are young, but we're making strides, for sure," Waldher said. "But it shows we're a young team that when the game got close we consistently made the wrong play at the wrong time. We just didn't execute down the stretch. "Our kids played hard, and I want to give a shout out to our student section. We want to get them bigger, and it's growing. The support from the alumni and the boosters is coming back, which is good. "We basically have an all-new team this year. It's almost like we're all freshmen. There's some growing pains, but we'll get better." St. Helens was coming off an 82-38 opening loss on the road to one of the state's top Class 5A teams, Silverton. The Lions looked more polished against Dallas. Their press break was much better than it had been in last week's jamboree with Benson and Canby. Their passing was better. Their rebounding showed effort. And they had some spurts on offense that gave them some leads. That all enabled St. Helens to make a game of it basically all the way. Dallas led 12-7 after one quarter, 25-23 at the half and 42-37 through three quarters, but never could pull away. When St. Helens junior Gavin Knoke hit a 3-pointer to open the fourth quarter, the Lions were within 42-40. St. Helens trailed 46-44 with just over five minutes to go, but the Dragons scored the next seven points to seize command, finally. A steal by Lions frosh point guard Trevor Fitzgerald led to a fast-break layup by Knoke at the 2:08 mark that cut Dallas' lead to 53-48. But that was as close as the Lions would come down the stretch. Knoke led St. Helens with 17 points, sinking all but one of the team's 3-point baskets. He was 5 of 14 from beyond the arc, and the rest of the team was 1 of 23. The 6-2 Knoke was coming off a 21-point game at Silverton. "He played well. He's just getting better," Waldher said. Senior post Parker Miller had 11 points and a team-high nine rebounds, five on offense. Senior forward Chris Beatty scored 10 points. Fitzgerald shared team-high honors in assists with three, led the Lions in steals with four and committed only two of their 19 turnovers. "Our freshman group I'm excited about," Waldher said of the program's youngest class. St. Helens' best surge came early in the second quarter, when the Lions moved the ball crisply and converted on four of five possessions. That helped them grab a 21-14 lead. In the second half, Dallas benefited from a parade to the free-throw line. "I've never seen so many fouls in one quarter, but I'm not pointing at the officials. We're just learning how to play," Waldher said. Foul trouble cost the St. Helens coach two starters early in the fourth quarter, as Miller and then Beatty fouled out. Also, senior forward Hunter Wetherbee went out for a while when he absorbed a blow to his nose late in the first half. But the Lions continued to battle, taking five charges in the game, for one thing, which upped their season total to 11 in two games. It was Dallas' season opener, and the Dragons had the most potent player on the floor in 6-6 senior Jack Anderson, an inside/outside threat who finished with 25 points. "He's a good player," Waldher said. "A fantastic player. Put it on the floor. Makes moves." Just having a close game was good experience for St. Helens, especially given the limited minutes played by anyone the previous season. "Hundred percent," Waldher said of the value of being in a game that was up for grabs. 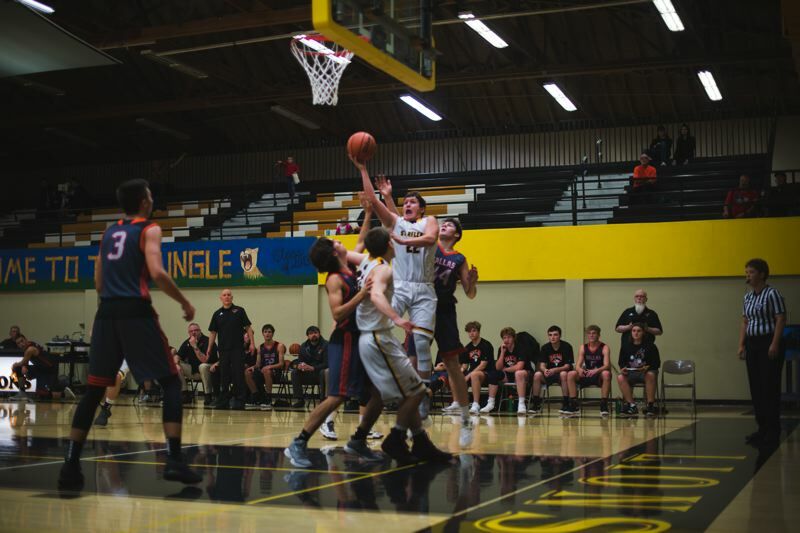 The Lions were scheduled to play at home again on Thursday, against Redmond, and they will have six more nonleague games from Dec. 11 to Jan. 4, with four of those games back on the home floor. That'll be a stretch for more learning and, hopefully, more progress. "The students created a good atmosphere, and we made it tough on Dallas," Waldher said. "Unfortunately, we just made too many mistakes. But by the end of the year, we will get better."